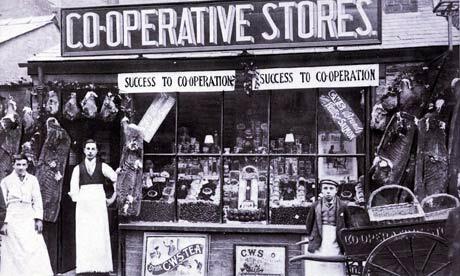 Today’s cooperatives trace their origins to England’s Industrial Revolution. In the first half of the nineteenth century, living conditions were extremely harsh for working class people in the textile milling towns of northern England. Mill workers labored long hours under dangerous working conditions for low pay. Plagued by unending poverty, they were forced to buy food on credit from merchants who charged high prices for goods that were poor quality and often adulterated. Owning no property, workers were unable to vote. These conditions gave rise to labor movements which drew great numbers of followers. During this period, cooperative initiatives were common, offering their working class Members the promise of economic opportunity and democratic control. 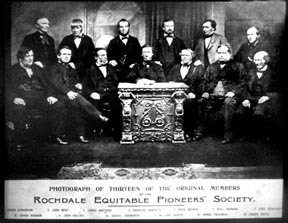 But until the founding of the Rochdale Equitable Pioneers Society in 1844, none were successful. When the self-described “Rochdale Pioneers” opened their first cooperative food shop, they sold only five products – butter, flour, oatmeal, sugar, and candles – but promised to provide Members with “purest provisions, giving full weight and measure.” They went on to establish many other Member-owned businesses. The principles and values that underpinned their way of doing business are still accepted today as the foundations upon which all cooperatives operate. These principles have been revised and updated, but remain essentially the same as those practiced in 1844. Want to read more about the history of cooperatives in the United States? We recommend the University of Wisconsin Center for Cooperatives’ fascinating summary Cooperatives in the U.S.